Grant High School’s drumline performed at a campaign rally for presidential candidate Hillary Clinton in Sacramento, California today. The drumline was recommended to Clinton’s campaign by the mayor’s office said Van Buren. The team was “so excited” to perform at the rally said Grant High School junior and drumline member Maceo Foreman. Most of the music the drumline performs is hip hop, rhythm and blues, and occasionally the members make their own music. “Some of the drummers come up with stuff and then someone else will do something that goes with it and before you know it there’s a song,” said Foreman. 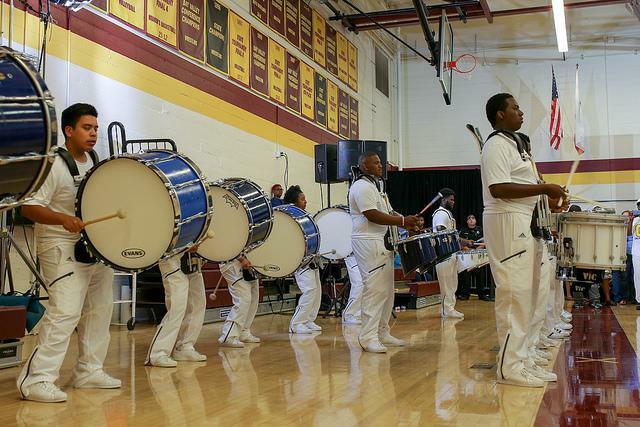 The drumline has been performing at different venues all over the United States. In 2014, the team performed on the Jimmy Kimmel show in Los Angeles. The performance was initially a surprise constructed by Jimmy Kimmel and Good Morning America anchor, Robin Roberts. Van Buren along with the drumline thought they would performing at a private venue in Los Angeles, when they were surprised with a $20,000 check, a new car for Van Buren, and the opportunity to perform on national television. This was the first time the drumline performed outside of Sacramento. The money granted to the drumline funded their upcoming trip to Washington D.C.
On July 4, they performed in Washington D.C. at the Independence Day Parade for president Barack Obama. The Cesar Chavez March and Breast Cancer Awareness festival at Cal Expo are two of the most recent and local events the drumline has performed. “My favorite song to do is probably Thizz Dance. Its really fun and upbeat,” said sophomore and drumline member Janasia Berreman. The drumline is set to perform in Japan in October and will be the first time they are all leaving the country. “I’ve never been out of America before so I’m really excited to go to another country,” said Foreman. Be the first to comment on "Grant High School’s drumline performed at the Hillary Clinton Rally in Sacramento"